The average weight of pork loin is 1.3 lbs. 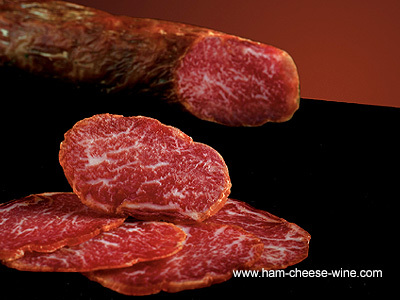 Iberico Pork Loin de Bellota Fermín is a Spanish cured sausage with a characteristic red color where white fat veins are observed. This Spanish sausage is made with pig loin muscle free of external fat and tendons. Iberico Pork Loin de Bellota Fermín is marinated and undergoes a process of maturation and drying that ensures a smooth and crisp texture with flavors reminiscent of acorn, paprika and mountain oregano. West of Salamanca in Spain in the beautiful village of La Alberca is a family business dedicated to the production of hams and sausages. 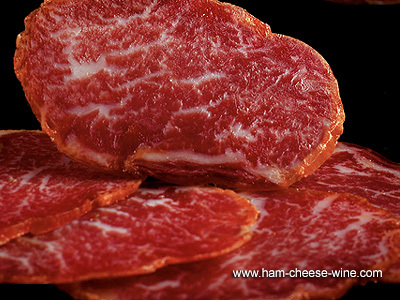 This company is considered as the first Spanish producer of these delicacies which has allowed it to sell and export to markets such as the USA, offering the best quality and a wide range of Iberian products, among which stands out Iberico Pork Loin de Bellota Fermín, made exclusively from Iberian pigs. As a curious note, the Iberian pig used for the preparation of Iberico Pork Loin de Bellota Fermín is one of the last of this species reared traditionally, these animals graze freely on farms intended for breeding where its ecosystem dominated by oak trees guarantee their natural feeding and allows these Spanish sausages to have a very particular taste and texture. These Iberian pigs descend from wild boars, a breed that stores a high percentage of fat in their muscles that makes it very tasty and highly prized by consumers. The Iberian pig breed used in the preparation of this delicious Spanish sausage is the popular "pata negra" breed originating from wild animals that inhabited since ancient times the Mediterranean basin. With the cross breeding of races in search of different proportions between flesh and fat, this breed started to disappear in Europe, now existing only in a few corners of the Iberian Peninsula. These beautiful animals provide the excellence of Iberico Pork Loin de Bellota Fermín. 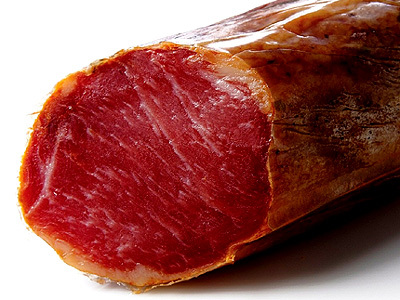 Why add Iberico Pork Loin de Bellota Fermín to my diet? Iberico Pork Loin de Bellota Fermín is a natural product with curing that can last up to three years before reaching the market. It is rich, full flavored and it truly melts in your mouth, the best Spanish sausage in the world. Iberico Pork Loin de Bellota Fermín contains a high proportion of monounsaturated fatty acids which effectively impact on blood cholesterol and increases the HDL, also called "good cholesterol" reducing LDL, "the bad one". This quintessential Spanish sausage is the best cardio-healthy animal fat by having an unsaturated fatty acids proportion above 70%, a typical treat of Iberian pigs. Iberico Pork Loin de Bellota Fermín is made with meat from Iberian pigs that are exercised in the wonderful mountain oak meadows feeding on acorns, wild herbs and mushrooms, which allow for the unmatched flavor of these Spanish sausages. This Spanish sausage is cured with sea salt, garlic and smoked paprika, giving it a unique flavor with very little fat. Having an unmatched and wonderful flavor, people who eat it love to cut it into thin slices and eat them alone or accompanied with Manchegan cheese or slices sprinkled with olive oil. Iberico Pork Loin de Bellota Fermín is produced with 100% Spanish Iberian pig meat and cured in Spain, making "Embutidos Fermín" the first producer of Iberian products approved for export to the USA. The dry air of the prairies of La Alberca and short summers make this place ideal for the traditional curing of this Spanish sausage. The ingredients used to prepare Iberico Pork Loin de Bellota Fermín are: Iberian pig loin, salt, paprika, garlic, oil, oregano, nutmeg, sugar, antioxidant E-301 and preservatives E-250 and E-252. Natural pork or fiber casing, gauges: 85, 75, 70, 65 and 60 mm.